Info "Using the power of the Form Baton and the Balance Stone, this man makes dreams come true. Next, pro soccer player!" 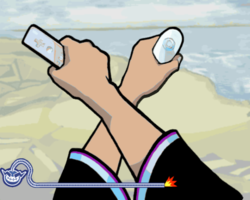 Finishing Move is one of Orbulon's Microgames in WarioWare: Smooth Moves. The player must copy the man's movements with the controllers. 1st level difficulty: One position per controller. The position is an X. 2nd level difficulty: Change the position (or if left-handed). 3rd level difficulty: Change the and positions. This page was last edited on February 20, 2018, at 18:25.